Recently I had my computer crash and when I tried to restart it I found that I could not get into Windows and when this happened I was both upset and worried that I may not get my files off my hard drive. Now thankfully most of my files were backed up to another drive but I found a way to access my files without windows. Using a Linux Live CD which is an operating systems running from a CD/DVD or USB drive you can view your files and copy them to an external hard drive. Even if you think you would be able to use Linux to get your files of the hard drive the Live CDs I will talk about have an interface similar to Windows and would not take a lot of skill to use. For this to work you will need a second computer, a flash drive or CD/DVD, and an external hard drive that you will use to copy your data from the corrupt hard drive to the external. Before you can access your files you need to make a Live CD or USB drive that you will insert into your computer that is not functioning. To make a Live CD or USB you need to have a working computer, CD/DVD drive and an internet connection. The next step is to choose a live distro of Linux to use to access your hard drive. There are many different versions of Linux but I am going to suggest two different ones that you might want to use. If you would like to look through the many different Linux distributions there is a Wiki about them. My suggestion is to use Knoppix a well know Live CD Linux with many features for you to use. You can download an iso file of Knoppix and burn it to DVD/CD or if you are unable to download it you can order a DVD by mail. If you download the iso file you will then need to burn it to a bootable CD/DVD or setup a bootable flash drive. If you are going to use a USB drive you can find instructions at PendriveLinux. To burn a CD/DVD with the Linux iso you want to have burning software that will work with images and can create a bootable disk, I use imgburn it is free and easy burning software. Now I said that there is a different version of Linux that I suggest and this is the same as Knoppix but it is designed to recover files and work on File systems, RAIDS, and partitions. The only reason I recommend thinking about using Knoppix is that it is a full OS and has additional features that you may need in the future. Also Runtime Live CD is experimental and may require a higher skill level than you have when it comes to using the Live CD. If you want to look into this OS to see if it would help recover your files you can find it at Runtime Software. No matter which distro of Linux you download you would make a bootable CD/DVD or USB drive the same way. Now here is a tricky part of booting into your Linux Live CD depending on how old your computer is and how it is setup you may have to do some work to get your computer to boot from the DVD drive or USB. Depending on the computer it is usually easier to get the BIOS to boot to a DVD than to a USB drive. Newer computers will set the CD drive to boot before the hard drive so to start you may want to insert the DVD and turn on your computer to see if it will boot to the DVD. If your computer sees the DVD it will usually show this on screen and you need to hit enter to start the DVD boot. Once Knoppix starts booting you will want to choose to boot the live OS with graphics so you can easily use the Operating system to get your data off of your hard drive. Now that you have the Knoppix desktop up you will want to connect your external hard drive or flash drive in to start copying files. Once you have your external drive connected to Knoppix you have a couple of options depending on how much data you have that needs to be backed up. First you can completely back up the hard drive with everything on it. This is helpful when you have a large amount of data and don’t want to transfer folders to the external drive. The one thing about backing up the entire drive is it will take a long to time back up and you will not be able to use Windows and programs that you back up you will need to reinstall them after you format your hard drive. 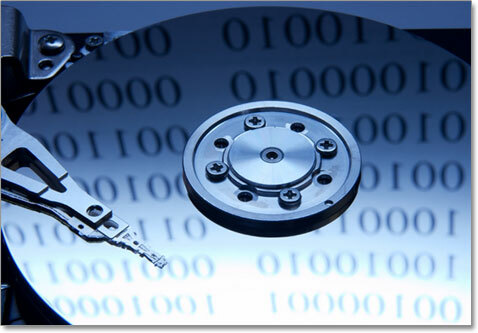 You will find your hard drive under mnt/ and either hda1 or hda2. you will know that it is your hard drive when it shows Windows, Program Files. If you are using Windows Vista or later your personal data will be found under Users/(yourname)/ and here you will find your Documents, Desktop, Downloads, Pictures, and Music. This is where most of your data is going to be at but you want to make sure to look around on the hard drive in any applications to find your data. 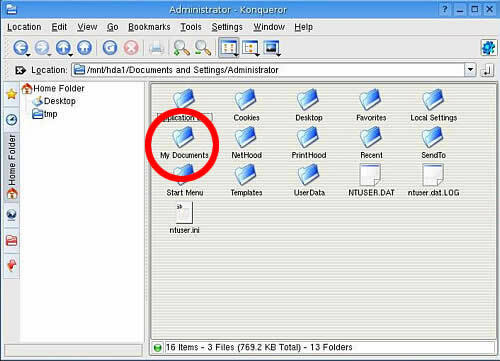 If you are using a Windows XP or older computer than your personal data will be found under Documents and Settings like shown below. Now that you have found your files you want to transfer them to your external hard drive and it is important to remember if you use Outlook or Windows Mail than your email is downloaded and stored on the computer and you will want to backup those files as well to save your email. If you access email from the web then all your email is stored online and backed up. Once you have moved all your data to the external drive you will then be able to restore your Windows operating system. Depending on what type of computer you have you should either have a computer restore disk or a Windows restore disk. You want to run these which will delete everything off of the computer and restore it back to the original state. Once this is done you cannot go back so it is very important to ensure you have all the data you want of the disk because it will be deleted when you restore Windows. It can be hard and time consuming to restore your computer so it is a good reason to have some backup system that is not connected to your computer either by backing up your computer to an external hard drive or purchasing cloud services that automatically backup your computer. No matter which option you choose it is worth the extra costs to save your data and lessen the work you have to do. especially while talking about search engine optimization. you can talk with other authors and start doing co-promotions with authors in the ame genre. (SEO) marketing and other online efforts in 2007.